Brownie lovers will swear that leftover brownies could never happen in their house, but life is full of surprises. 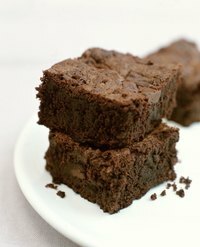 Perhaps you baked for 30 guests and only had five show up, or maybe you're looking to keep yourself from an uncontrolled brownie binge. Whatever your reason, the bottom line is that there are brownies to be dealt with. You can always wrap and freeze them for later, but another alternative is to dry your brownies in the oven and convert them to versatile chocolate crumbs. Rum balls are a fragrant, old-fashioned dessert made from crumbs. Start by toasting walnuts or hazelnuts, and the pulsing them to a fine texture in your food processor. Add the brownie crumbs along with confectioner's sugar, cocoa and corn syrup, and enough rum to make everything aromatic. Chill the soft, sticky batter until firm, then shape them into balls the size of large olives and chill again. Roll the rum balls in crushed nuts, cocoa powder or confectioner's sugar, or dip them in chocolate. Let the balls mature a few days before serving, or keep them refrigerated for months in an airtight container. Cake pops are another simple but festive treat made with crumbs, and brownie crumbs will work just as well as cake crumbs. Pulse your dried brownie crumbs in the food processor, then pour them into a mixing bowl. Stir in enough chocolate icing to stick the crumbs together, and refrigerate the mixture to stiffen it up. Shape the chilled mixture into balls, and press a lollipop stick into each one. Dip them in chocolate, and decorate them while wet with sprinkles or when set with a drizzle of white chocolate. Crumb crusts are a popular option for many kinds of tarts and tartlets, as well as New York-style cheesecakes. Using brownie crumbs, rather than cookie or cake crumbs, will give your crust a more intense chocolate flavor. This can complement a chocolate or coffee flavored filling, or provide an interesting foil to vanilla or fruit flavors. In Europe, cake scraps are carefully hoarded and the resulting crumbs used to make a variety of cakes and desserts. A good cookbook of German or Austrian pastries and baking will provide several ideas. Brownie crumbs can also be used as a fun, tasty food in their own right. If you're decorating a cake, use brownie crumbs across a portion of the cake as "dirt," and pipe icing flowers that are "growing" out of it. Or, for a kid's birthday, fill cups with brownie crumbs and gummie worms for the classic worms-and-dirt kid treat. Sprinkle brownie crumbs over ice cream as a sundae topping, or layer them into a parfait glass along with ice cream, frozen yogurt or pudding. What Can I Use Instead of Bread Crumbs for Salmon Cakes?